In support of a broader approach to rehab. The days of simple localized rehab are coming to an end. As Pilates teachers we see a lot of clients who are recovering from soft tissue injuries like tendonitis or bursitis. These clients have usually completed physiotherapy treatments or are starting Pilates in conjunction with clinical treatments and we begin by watching them do their assigned exercises. These days the more progressive therapists seem to look further, beyond the local area of injury to solve a recurring problem. This makes sense as its now evident that we need to look at the whole body to help reduce recurrence – not just the specific area of pain. This is an important shift in approach and it is logical. It makes sense that an irritated tendon or nerve can be the byproduct of stresses and strains on the tissue instead of being the actual cause of the problem. For example, the sciatic nerve is irritated, resulting in sciatica, but the nerve itself is not generating the problem. Why was it stressed in the first place? Unravelling these stressors requires a more comprehensive assessment. Pilates is well suited to this broader approach. It offers the diversity allotted by the equipment and repertoire, the inherent whole body focus, the philosophy and the time. A lot can be accomplished in a one hour session. Let’s look at a common shoulder problem: impingement of the rotator cuff muscle, the supraspinatus. The tendon of this muscle runs across the top of the scapula and attaches onto the top of the arm (humerus). It functions to stabilize and centre the joint and assists movement. The tendon passes through a very small tunnel (the sub acromonian space) on the scapula to reach insert into the arm, and it’s at this outlet that the pinching or impingement occurs. Here is a possible sequence of treatment. Base level treatment deals with the local problem – the irritated tendon itself. Techniques are used to lessen the inflammation and calm the pain. The next layer of treatment might address the local joint mechanics – how the arm bone (humeral head) is aligned and moves in the socket. Another step in treatment would be to look at the positioning of the scapula. 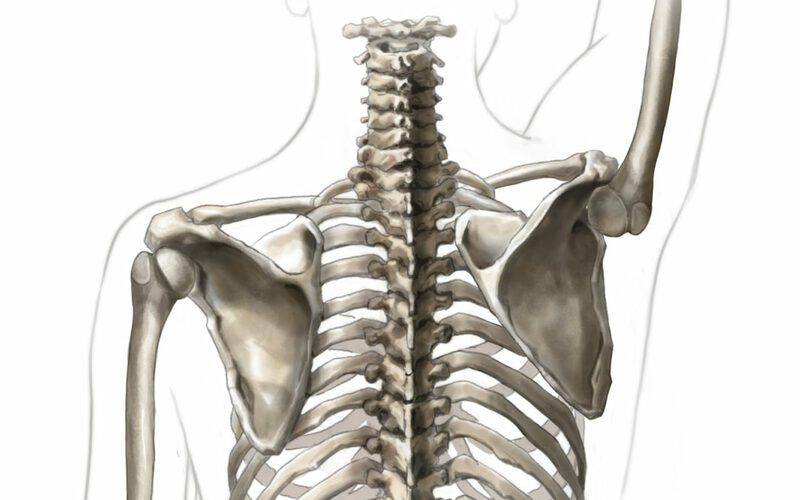 An assessment of how well the scapula moves on the rib cage, and exercises to improve it’s positioning. 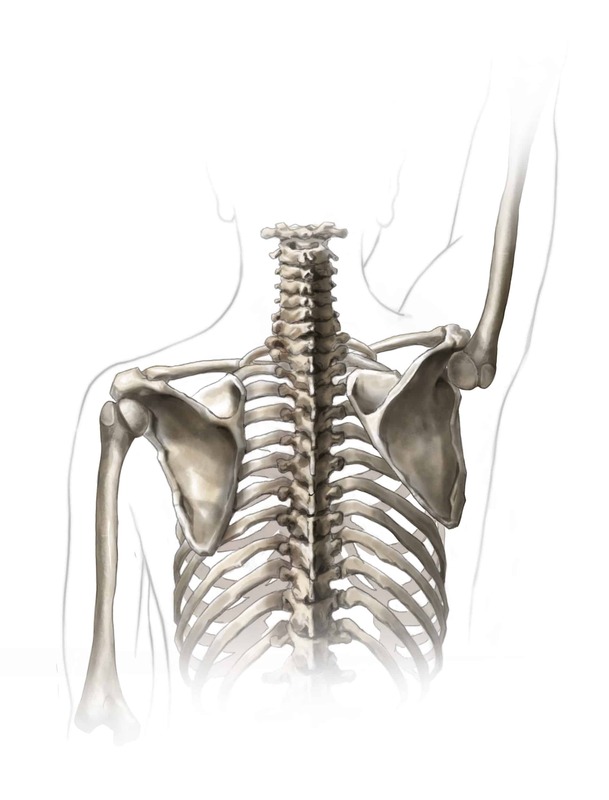 Movement of the scapula is affected by the mobility of the ribcage. Exercises to address ribcage mobility and function can improve the shoulder joint placement. To delve further, the ribcage might be affected by the excessive tightness in the upper abdominals. Is this lack of mobility contributing to the impingement? Perhaps abdominal work incorporating eccentric lengthening should be included in the program. Are the abdominals tight because they are responding to a sway back posture and counterbalancing the forward shift of the hips? I could go on. The point is that if you are getting unsatisfactory results with your recovery, consider where your rehab plan stops. If you are only dealing with levels 1 – 3 maybe you need guidance to address mechanics further. This is also where Pilates and physiotherapy can work well together. Where physiotherapy can diagnose and manage the initial stages and where Pilates can take you further into a long term plan towards better muscle balance and improved mechanics throughout your body. Not everyone wants to delve this deeply and not every teacher wants to teach this way. It takes planning and reassessment and greater effort than a traditional workout. But if you are willing to go the distance, make sure you work with a teacher or trainer that can help guide you there.